Hunting Canada? CWD Transport Laws For Getting A Buck Into the U.S.
Over the next 4 months, thousands of hunters will travel north to Alberta and Saskatchewan in search of big mule deer and whitetails. If your passport and paperwork are in order, getting into Canada with your bow or firearm is usually not much of a hassle. But nowadays, if you’re successful, getting your buck back into the U.S. can be a major hassle unless you know and follow the ever-changing rules for transporting deer parts. –The Big One: Before leaving camp and crossing the border you must remove all brain and/or spinal tissue from the skull plate with antlers attached, as well as the raw cape. Thoroughly scraping all traces of brain and tissue from a skull plate should suffice, but it depends on the wildlife officer that checks you at the border. I recommend you boil the skull plate in water to remove all trace tissue. Flesh out the cape thoroughly, until it is entirely white. –Crossing the border with a full skull and antlers (for a European mount) is tricky. All flesh and soft tissue on and inside the skull, including brain matter, must be removed. Also root structures and other soft tissue should be removed from all teeth. The CWD Alliance recommends cleaning a skull by soaking it in a 50/50 solution of chlorine bleach and water. –Bowhunters heading to Alberta or Saskatchewan in September take note: Velvet-covered antlers are included in prohibited parts that you can transport. 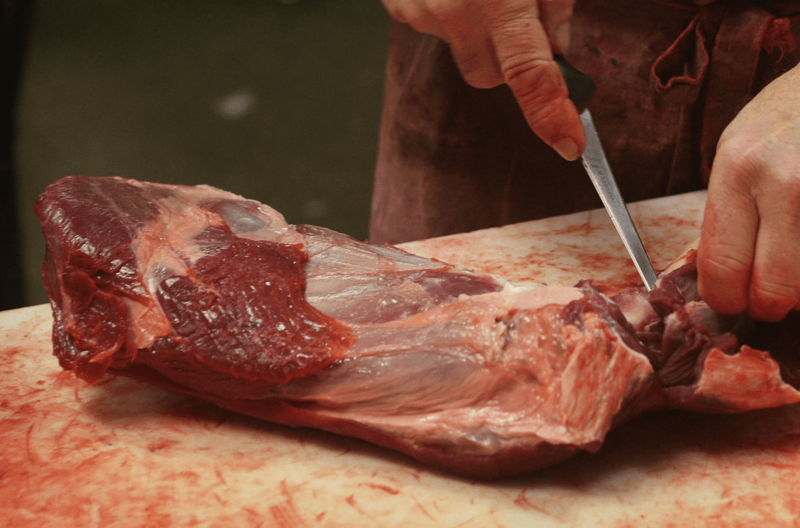 —If you want to bring home some venison, you must completely de-bone the meat. –Finished taxidermy products are not affected by the CWD ban. 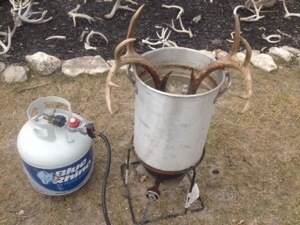 To forego the CWD and travel hassles, some hunters, including me, leave their bucks with Canadian outfitters. The outfitters take the deer to a local taxidermist for a shoulder or European mount. Eight months or so later, the taxidermist ships your buck back to you in the U.S. When all is said and done, this will cost you a couple thousand dollars (less for a European). But it’s the easiest way to get your buck home, no doubt. If you go this route, make sure your outfitter has a reputable taxidermist lined up! CWD regulations are continually evolving. Before heading to Canada, or anywhere out of state to hunt, check the CWD regulations in your home state and any state you will travel through with deer parts on the way home. Will Summer Whitetail Bucks Stay On Your Property This Fall? 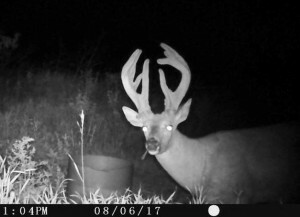 You set cameras and scout and look all of August, and locate a big 10-pointer and a couple of great 8s, any of which you’d love to tag this season. Will the bucks stay on the property and in the same general area come late September and October? Or will they go AWOL, never to be seen again this season? Tennessee researcher Bryan Kinkel has conducted extensive preseason censuses of the whitetails that live on his clients’ hunting lands across the Southeast. His observation data and trail-camera photos show that 50 percent of the older bucks may spend the spring/summer months at one end of their home range, but then shift to another core area for fall and winter. These seasonal ranges may have little or no overlap. His data shows these shifts most often occur around the time bucks shed their velvet–roughly September 5-20. So that furry-racked monster you spot in a bean field this weekend might be long gone when bow season opens. How far might he go? Missouri biologist Grant Woods says it could be a few hundred yards or several miles or anywhere in between. If you hunt 1,000 acres or more, it’s no big deal. Most of the bucks that shift will still live in your zone, you just need to scout more after September 20 to pin them down. The problem is when you hunt 50 to 300 acres, like most of us do. “On a 300-acre property, a buck that shifts only 500 yards or so could move right off your property and onto a spot where other people are hunting,” Woods says. The good news: While half the mature bucks might leave your land in mid-September that many more that summered elsewhere are apt to move in and stay on your property this fall and winter. Generally a property sees a zero net loss of total bucks from summer to fall and winter, but the identity of those bucks can change dramatically. So when you see a new a big buck pop up for the first time on one of your cameras in October or November, that explains it! One more thing about buck movements, which could be good or bad news for you. “Our telemetry studies show that bucks range less as they get older and older, and their summer and fall/winter core areas overlap more,” says whitetail biologist Mickey Hellickson. So a buck that comes and goes off your land when he’s 3 ½ and 4½ might stop moving around so much if he lives to the ripe old age of 6, which is very rare for a wild buck. A really old buck might summer and winter in 100 acres on the property you hunt (good) or he might move off your land one August and never come back (bad). The Right Rubs: In the book Whitetail Country Michigan biologist John Ozoga points out that the first good-sized rubs–on trees 2 to 4 inches in diameter–that you find in late September were made by bucks 3½ years and older to mark their home ranges and “to proclaim their control over a given area.” Other bucks and does will see the fresh blazes, and they might come over and lick or rub their heads on them. But those deer will get a whiff of the rub maker’s fore-head and salivary scent, and they’ll know who’s living there large and in charge. Finding clusters of big rubs is a key strategy for your entire season. From late September through December, most of the bucks that blazed those rubs will spend 90 percent of their time on the same ridges and in the same bottoms where you find the sign. So find the early rubs; scout out from them a couple hundred yards for the best food sources, trails, funnels and bedding thickets; and hang some tree stands at strategic points. Hunt those stands all season, and you’ll see some shooter bucks. Scrapes: Back Off! QDMA biologist Kip Adams points to a comprehensive University of Georgia study of free-ranging deer that live on a 3,400-acre property that is hunted each fall. I put the most stock in studies that deal wild, hunted deer, not pen whitetails. Most all deer research over the years has found that bucks check scrapes mostly at night, and the Georgia study, the largest of its kind, confirms it. 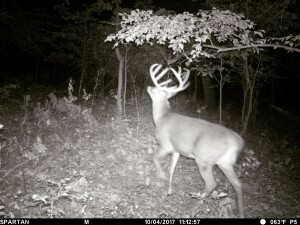 The researchers tallied thousands of trail camera images and found that mature bucks check scrapes mostly between 2 a.m. and 3 a.m.
Low-Pressure Stands: In a South Carolina study, researchers analyzed hundreds of interactions between hunters and deer, and found that mature bucks traveled 55 yards on average farther away from hunting stands at the end of the season versus the beginning of the season. This confirms something I have been writing about and saying on my TV shows for years: Mature bucks can learn your habits and pattern you. As the season progresses they see, smell and hear where hunters walk into the woods, climb trees, walk out at midmorning or after dark… You get the picture. 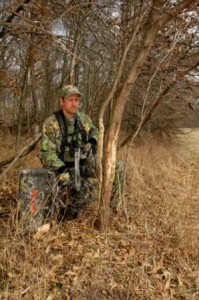 The bucks then start to skirt those stand locations and access points to avoid you. This fall, change it up. Say you’ve been bowhunting a big 10-pointer for a few weeks from the same 2 stands in a 200-acre block of woods. You saw the deer a couple of times early in the season, but it’s been awhile since you’ve seen him now. Check the lay of the land on maps or Google Earth. Then at midday, slip into those woods and set a couple of new stands along trails, in draws, at creek crossings, etc. You don’t always have to move far; you might set some of those new stands on good cover edges or funnels only 40 to 70 yards from your original stands. Play the wind and be as quiet as you can as you set the new stands. When you sneak back in and hunt those fresh stands, you have a good shot at surprising that buck in a spot where he doesn’t expect you. 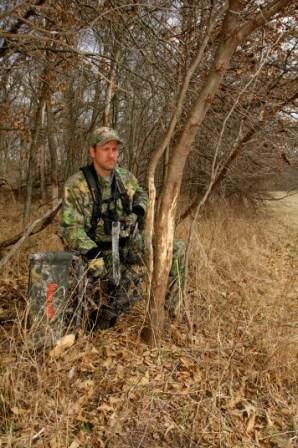 As he moves on a pattern to avoid your first stands, he might walk 10-20 yards below one of your new stands. Take him! Think Green (Part 1): Biologists in Michigan, Minnesota and other northern states have found that 5- to 40-acre conifer swamps, with trees 10 to 25 feet tall and canopies 50 to 70 percent closed, provide the best thermal cover for deer. If you bowhunt the late season up North, look for green covers of that size, and hang a stand on a nearby trail. Think Green (Part 2): After killing a deer late in the season, Pennsylvania ruminant nutrition specialist Phil Anderson pokes through the paunch to see what the critter had been eating. “Ever killed a doe or buck in December when the woods are brown, but the rumen contents (of a deer’s stomach) are bright green?” he asks. He points out that deer love tender, green shoots year-round and particularly in the winter. The animals sniff and dig around the woods and find them under rotting leaves. Next December and January, be on the lookout for spots where deer have dug and pawed the leaves (deer sign is narrower and more linear than wild turkey scratching). Get down on hands and knees and investigate. 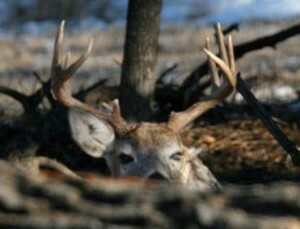 If you find little green shoots popping up, set up there and fill your last doe or buck tag. Beat the Head Bob: In a study funded by the Georgia Department of Transportation in hopes of reducing deer-car crashes, Dr. Karl Miller and others focused on the whitetail’s vision. They confirmed that to get a good 3-D look at a strange object, a deer has to shift its head and stare at it from several different angles. You’ve seen that before—a deer sees you and starts head-bobbing as it tries to figure out what the heck it is looking at. The next time a doe or buck looks up into your tree stand and starts head-bobbing, freeze. When the animal dips its head and appears to look away, stay frozen. Only when the head-bobbing stops for good and the deer relaxes and seems satisfied that you are not dangerous should you shift in your stand and draw your bow. A deer’s eyes are well adapted to detect movement. Tiny hairs on the velvet stick out and make the antlers look thicker than they are. The hairs act as a radar system so a buck won’t bump into trees, fence posts, etc. and damage his soft antlers. Sebum, a semi-liquid secretion, on those hairs gives the velvet a shiny look. Sebum also supposedly acts as an insect repellent to keep gnats, biting flies off a buck’s rack and face. By mid-August most of the antler growth for the year is done. Sometime between September 1 and 20 bucks will shed the velvet. The cue for antler hardening and the velvet shedding is the change in photoperiod caused by decreasing daylight and increasing darkness, which results in a significant increase in the bucks’ testosterone. Whitetail Science: How Well Do Deer Hear? Deer do not hear that much better than we do! The frequency of sound is measured in hertz. Studies have found that a healthy human can hear from 20 to 20,000 hertz, with our best and most sensitive range from 2,000 to 5,000 hertz. The researchers found that deer hear best at moderate frequencies of 3,000 to 8,000 hertz. To put perspective on it, both our normal speech and most deer vocalizations fall within these frequency ranges. So while deer generally vocalize at lower frequencies than we talk, they hear similarly. How deer use their ears makes us think the animals can hear a lot better than we can. Deer ears are like tiny satellite dishes that tip back and forth and roll around to pick up, sort out and lock in on various sounds in the woods. Think about this, because you’ve probably been there. A buck is within 100 yards and hears you bang your bow or gun, or scrape your boots on a metal platform; you watch him work his ears, look your way and start stamping his foot. Wow, those ears are amazing and almost supernatural, you think. But Dr. D’Angelo points out that the animal is simply reacting to a strange and potentially dangerous sound in his environment, in much the same way that we jump and look if we hear a sudden horn or a car backfire nearby. The sounds and frequencies of grunt calls match well with the whitetail’s hearing. As an off-shoot of this study, the researchers analyzed several brands of grunt calls to see how they aligned with the hearing of deer. All the calls produced similar sounds with the strongest frequency range between 3,000 and 4,000 hertz—well in tune for a doe or buck to hear your grunts. Dr. D’Angelo points out that while your grunt call sounds true and is well tuned to a deer’s hearing, it is not as loud as you think. So if you’re “calling blind” with no deer in sight, don’t be afraid to grunt loudly, especially during the rut. There’s a good chance that somewhere out there in the woods an old 8-pointer will roll his ears and home in on your stand. Keep grunting and with luck he’ll come.